Shopping is always a treat in Europe, but with the Euro (and GPB) at a continued low relative to the dollar, some of the price differences on designer goods can be quite significant! If you plan on traveling there and have a particular item or two on your wishlist, it could be well worth it to wait and purchase abroad. In this post I wanted to share some general shopping tips, and for an upcoming post I’ll have price comparisons on popular items (including what I got! ), along with notes for shopping at specific stores like Hermes, Chanel, Celine, and such. – Visit the brand’s website and change the geographical location to that of your destination. If the brand does e-commerce (like Prada, Fendi, LV) this setting is easy to switch as the “shipping destination.” If it doesn’t (like Chanel, Celine), changing the language alone won’t give you prices in local currency, so it might take a little maneuvering to fake your browser’s geographical location. – Websites like Spotted Fashion or Brag My Bag have fairly current prices by region for popular designer goods. Here’s one for Chanel bags in Europe, for example. Notes these prices are updated by their website contributors or members, so might not be 100% up to date or accurate. – You could also try calling or emailing a specific international boutique to ask. There’s nothing like hefty fees hacking away at a favorable exchange rate! Many credit cards charge 3% on foreign currency transactions, and those currency exchange kiosks at the airport have terrible conversion rates (no surprise) plus a fee per exchange. Use a credit card without foreign transaction fees. There are several credit card review websites out there with comparisons on the best cards without such fees! Choose local instead of home currency on credit card purchases (of course, this only applies if your credit card doesn’t charge foreign transaction fees). When using a US-based credit card, sometimes at checkout in a foreign country you get the choice of being charged in the local vs. your home currency. This may seem enticing, however I’ve calculated the implied conversion rate a few times for home currency and it’s always notably less favorable than the actual conversion rate. Notify your credit card company of upcoming travels, to avoid finding your card frozen by the fraud monitoring department just as you’re trying to purchase that dream bag! Unlike in the US where tax is an additional amount charged at checkout, price tags on goods in the European Union countries already include a hefty tax (averaging around 20%) in the displayed price. Non-EU residents can get a portion of that tax (~ 12%) refunded on non-consumable merchandise. So for a purchase totaling 1000 EUR at checkout, you could receive 120 EUR back. Here’s how to make sure you get that refund! 1. Make a qualifying purchase at a participating retailer. In France, in order to qualify for a VAT refund you need to spend a minimum of 175 EUR at one store (minimum threshold differs from country to country, and France has the highest!). All the bigger and chain stores I went into were well-versed in the VAT refund process, but I wouldn’t be sure about smaller businesses – doesn’t hurt to just ask. 2. Prior to checkout, tell the store associate that you need VAT refund paperwork. You’ll need to show your passport to prove you’re a non-resident, then receive an envelope with the refund paperwork along with a receipt. You’ll receive a new envelope at every store you make a qualifying purchase. 3. Before leaving the European Union, show your purchases and get your paperwork stamped by customs at an airport tax refund counter. If you visit and shop at multiple EU countries, just make sure to have all your forms stamped prior to flying out of the last one. And if you’re leaving by another means of transit like train or car, it could get a little tricky finding an office. Make sure to allocate enough time before your flight, as the refund counters could be crowded or hard to find. Some of my purchases were successfully “stamped” by a quick kiosk, whereas for others I had to show the agent. You might also need to show the agent proof that your purchases are leaving the country, so if you packed your items in luggage that will be checked, do this prior to checking in. I’ve also been told to avoid wearing the merchandise at the airport in order to show that it is new. Heads up: The tax-free counter at Charles de Gaulle airport can be an absolute zoo. Prepare to futilely swim to the front through a sea of tour group grandmas wielding 3 LV bags each. We’ve also flown out of Orly in Paris and I was literally the only person at that counter, which is oddly located on the arrivals floor (but downside: no good shopping at Orly while waiting for your flight). 4. Choose to receive your refund either immediately at the counter in cash, or via your credit card which takes about 3 weeks. If you choose cash, the amount is less (10.8% cash versus 12% on a credit card) and it’s given to you in the local currency. On the plus side, you do get it immediately without risk of potentially never receiving it. Note most stores use a third party service (the main ones are Global Blue or Premier Tax Free) to facilitate the refund paperwork process. These intermediaries take a portion of the refund as a admin charge – the 10.8% cash and 12% credit card refund rates are what you’re supposed to receive net after admin charges. to any inquiries of missing refunds. Ted Baker coat & Celine box bag ~ two of my VAT-free souvenirs! Compile a specific wish list and stick to it to avoid impulse purchases due to aimless browsing and VAT refund goggles (“oh…I know this $3,000 bag isn’t the size or color or style I wanted, but its so much cheaper here than in the US! !”), especially ones that can’t be returned. Most of my VAT-refund eligible purchases were stamped final sale. Shop at department stores to more easily meet the VAT refund minimum. If you plan on buying an item that falls below the minimum purchase threshold, see if it’s also available at a department store where you can buy items from multiple other brands in one place. Ask if you don’t see what you’re looking for. Designer boutiques often keep much of their stock in storage, not out on display, so ask if you’re looking for a specific color or material in something. Use the store inventory system. If the store you’re at doesn’t have what you’re looking for, politely ask your SA to help check whether any other nearby location does. Some brands (like H of course) may not allow this, but Celine, G oyard, Prada, Louboutin and a few others were all happy to when I asked. One Chanel SA said they could not share info on stock between stores, but others still did. Shop for wishlist items early on in your trip. This allows max time to get an item if it’s not in stock at the moment. For example, one store had an item I was looking for, but only at their warehouse outside of the city which would take a day to ship from. Or, if something is out of stock, sometimes SAs know of upcoming shipments arriving over the next few days. And last but not least, some stores offer complimentary alterations, adjustments, or monogramming on select products but the service might take a few days to complete. Let me know if you have any questions on the above, and stay tuned for Part 2! I would also love to hear about your Europe shopping stories and tips, along with any great deals or memorable purchases from your trips! Great post, very informative! I've always wanted to see the Eiffel Tower in person. On a side note, with so many sales going on, I am torn between a light pink and a black parka, and I can't decide which to get, so I asked myself, "What would Jean do?" and I searched your blog, turned up nothing for "parka". Haven't you done a post about parkas? I've always wondered about the illusive VAT refund!! Thanks for the info! Wow, you're amazing Jean, great information, it sure helps for when I go on my dream visit to Paris and London, I also want to go to Italy, never been to Europe, sadly, but I hope I don't die before I can fulfill my dream! You're certainly an inspiration in all aspects! Awesome and helpful tips! Hope to travel to Europe this summer! Thank you so much for sharing these awesome tips! It's our dream to travel abroad and hopefully pick up some amazing deals like you did. These tips are amazing, especially since this process is a bit complicated. This is such helpful information, thank you so much Jean. I've been a fan of your blog for the past 5 years, I just love it! I've actually been waiting eagerly for your post re. 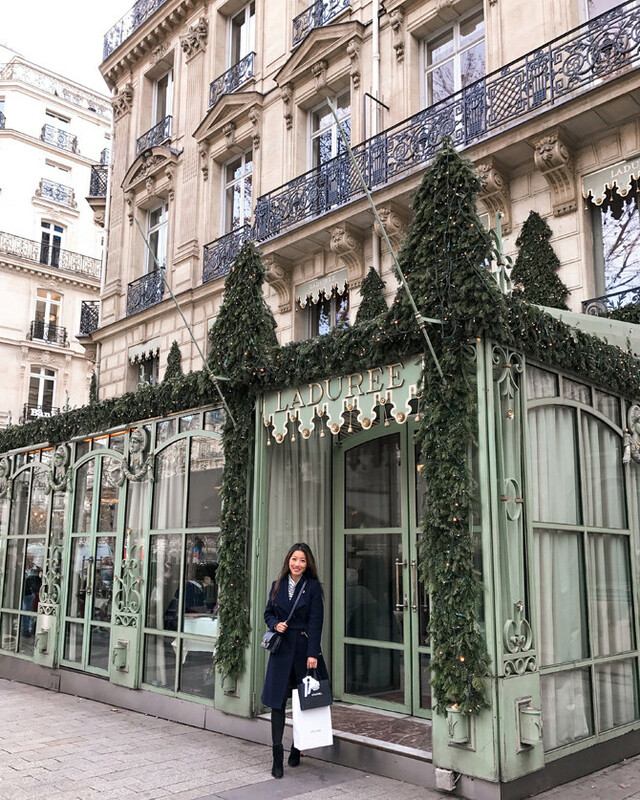 tips and pricing comparisons between the different luxury brands you compiled on your holiday trip because I am traveling to Paris today. I was wondering if you could please kindly share your notes about shopping at specific stores (Hermes, Chanel, Celine, LV, Dior, Longchamp, etc) you mentioned above as soon as possible because I only will be there for 5 days. This is just a request as I'm sure you live a very busy life and I will understand if you can't post in time for me to utilize your tips. Just an hopeful request from me to you 🙂 Thank you again! Would you consider sharing tips on guarding against pickpockets and gypsies? Great tips! You look so gorgeous! Can't believe I'm the only one who finds it tacky to try to get out of paying taxes in different countries. If you can afford to travel the world and buy a $1k bag, then pay the tax. Hi Leah – I disclosed it because I didn't want any professional conflicts of interests or independence issues. If that doesn't apply, I don't think you should feel pressured to share about your "outside of work" activities unless you feel comfortable doing so! Hi Jane – I actually don't really have a parka! I have two down coats, one from J.Crew which I blogged about last year and another lighter-weight one from Hollister. I personally prefer wool or more tailored coats, so unforutnately am not much help on this topic. I'd go with black though, just personally! You fail to see the point – shoppers getting back the VAT are savvy shoppers. They are contributing to the economies of foreign countries as they are spending money on these luxury items as well as lodging and food when they travel. Can you request VAT back from online retailers that charge it? If so, any instructions on how? Can you receive a VAT refund from online European retailers? If so, any recommendations or advice on steps? Maybe you missed Econ 101, there is NOTHING "tacky" when the savvy consumer contributes to a foreign country's GDP. Just saying..
Look, I love Jean's blog. I use her affiliate links to buy things because I do think she should be compensated for the work she does with this blog. I agree that regular clothing shouldn't have taxes, because clothing is a human necessity. But a Celine bag is not. The point of this post was to share tips for those who are traveling abroad and also happen to have designer items on their shopping list. The tax refund paragraph relates to an incentive that exists for shoppers, so I personally don't see anything wrong with taking advantage of it. There's clearly differing opinions on the topic, so it'd be great if we can just let it lie. Hi Jess – I was told online purchases are excluded from the VAT refund benefit. Hmm .. are they long enough to stay tucked in? My jeans here go several inches below the top of the boot opening so there's no issues with keeping it tucked in. Also try wearing socks that are the same color as your bootie and tucking your denim hem into the socks. Hi Jan – Thankfully I didn't encounter any but I know friends and relatives who were pickpocketed on the subway in France, so definitely be especially careful while riding public transit or in crowded places! I feel cross-body bags are usually the best for guarding against theft since you can wear it in the front and cover the flap or opening with your hand, plus there's a strap keeping the bag attached to you in case someone tries to grab it and run. Hi Vanessa, I haven't started on that post so unfortunately I don't think it'll be up during your trip. I hope you have an amazing visit and enjoy your time there! This is excellent. I'm planning my first abroad trip post graduation and I definitely have a bag fund in my savings. I'll be keeping this post book marked. I guess I must be stupid (or very very bad at math!) because I still don't understand how bags are cheaper in Europe. It costs $1.05 to buy something for 1 Euro, so everything you buy in say, London is a bit more expensive than it would be if you bought it in the US. Does the savings only come into play with the VAT refund? So even if something is more expensive in Europe, it ends up being less expensive than the US, only because we get a partial VAT refund? I would have thought the only way to get a luxury bag cheap is if the dollar was stronger than the Euro (say, if 1 euro only cost 0.75 cents in USD) then adding in VAT you'd get a bag cheaper. I bought a Prada in 2008 in Italy and while I love it, I've always hated myself for spending so much money when I could have bought it in the US. I was naive and did not get a VAT refund but the exchange rate was so bad that my Prada was horribly expensive & now I never buy luxury goods overseas. Hi Jessica – The main savings comes from the retail price, which is different in various geographical locations. A lot of European-based designers price items less in Europe, just like how Levi's is priced higher in Asia and that's why all the tourists buy it up when visiting the US…. The lower retail price, coupled with a weak Euro recently, plus the VAT refund contributes in total to the notable savings. PS – Tina, the Euro isn't less than the Dollar, but is almost equal! I will be flying out to London in a few weeks and will be leaving in/out of Heathrow. This will be my first trip to Europe! I plan on taking the Eurostar to Paris as well. Would you recommend purchasing a luxury handbag in London or Paris? As well, any thoughts on forgoing the whole hassle of on getting the VAT refund and just purchasing the item at Heathrow? Would the price reflect the exclusion of the VAT tax?